But time flies like an arrow! Anyway this is has absolutely nothing to do with todays posting, other than time really does fly. 3 years ago I spent a week on the Calf of Man for work, and it was here that I finally saw my very first chough. As a result of this sighting I wrote a short article of my time looking for them. Recently I came across this article again and realised it was three years ago. Braving the Irish sea, land-lubber Andrew Dawes is on a mission to see a mythical bird that he's waited 40 years to catch a glimpse of. Midsummer's day had just passed and with it the unsettled weather had begun to improve. I may hail from a long line of seafarers but there is a land lubber in me trying to get out. Thankfully the seas were calm as I, and the other members of the radio team left the English coastline by ferry. We were heading to an island just 33 miles long and 13 wide, sitting in the middle of the Irish Sea. Legend has it that the giant Finn MacCooil, standing in Ireland, picked up a rock and threw it at the mainland. Missing his target this rock landed in the Irish Sea and became Ellan Vannin, the Isle of Man. This island is clearly the offspring of its creator, Finn MacCooil, and punches well above its weight as a wildlife haven, not least as an internationally important location for marine life due to the warming waters of the Gulf Stream. I was excited. This place is a UK stronghold for one of the rarest members of the crow family, a bird I'd wanted to see for nearly 40 years. Would this trip give me that opportunity of a lifetime? Aside from making radio programmes, I had a personal ambition to fulfil. Cornish folklore has it that King Arthur turned into this bird when he died and will return to rule again if they ever return there to breed. I was however 250 miles north of Cornwall, so hopefully wouldn't be required to fight off members of the Round Table to finally glimpse a chough, or to be more accurate, a red-billed chough. To guarantee a chough though I'd need to travel to an uninhabited island off the Isle of Man's southern shores; the Calf of Man. A nature reserve owned by Manx National Heritage. The Calf is just one square mile in size and separated from the mainland by a narrow strip of water, the Calf Sound. It seemed close enough to walk across however the Sound contains three treacherous tidal races, fast moving tides flowing through a narrow passage causing waves, eddies and hazardous currents. So we left Port St Mary on the aptly named wooden supply boat the Scraayl, which is Manx for shearwater. The sea was like a millpond, sun glinting off the wavelets and many seabirds diverted my attention, particularly the rafts of guillemots passing by the boat like ladies off to a game of bingo. Leisurely we chugged along the coastline stopping briefly underneath Sugar Loaf stack, home to thousands upon thousands of seabirds. I however scanned the cliff tops as choughs can occasionally be seen flying with their acrobatic undulating flight overhead. But not today. 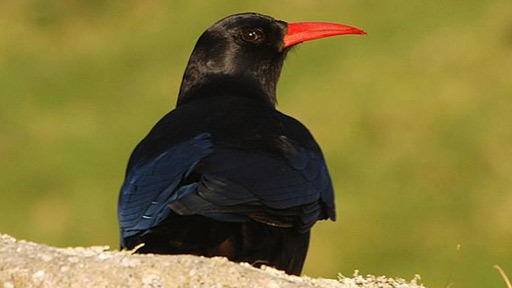 Just a handful of choughs exist in England (in Cornwall). The remaining 450 breeding pairs in the UK cling on to a precarious existence around the western coasts of Wales, Ireland, Scotland; and of course the Isle of Man. At a distance, choughs are easily confused with other crows, however they are unmistakable at close quarters, having bright red legs and a down-curved red bill used for probing short wet turf for soil-dwelling invertebrates. In flight they constantly call a screeching “chee-ow” while performing wonderfully swooping and buoyant flying actions. There are few more agile or graceful flyers. After recording all day, we found ourselves in the island's observatory preparing supper, before heading off on a midnight trip to record storm petrel ringing. I'd still not seen a chough. Others had seen one or two and I discussed my eagerness to see at least one chough before we left tomorrow. Kate (our guide from Manx National Heritage) informed me they were breeding in the old tower behind us and usually fed in the field in front. I had to go and see for myself. We'd not walked 200 metres when Kate called, "over there in the field!" My first chough looking just how I'd expected it to look. What a bill, in this evening sunlight the brightest post box red. But what's this? There's another and another. Kate was pointing across all the fields and there behind every tussock it seemed was a chough. Had they been hiding all day waiting for me to arrive, and like a surprise birthday party, were now rushing out to say "chee-ow"? I was looking at 11 choughs all told. I just didn't know where to look, they were flying, calling, swooping, this was just exceptional. Birds that I'd long waited to see were now everywhere. 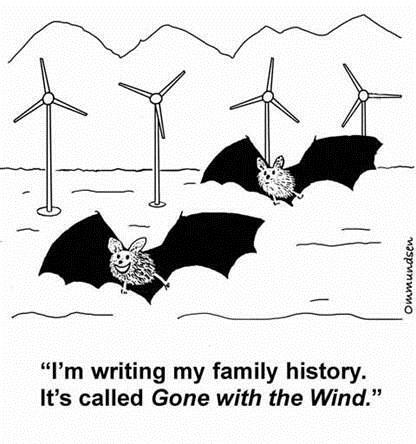 I may be a manly naturalist from Northumbria, but emotions took over and a small tear dropped from my eye. And then, behind me, a loud "chee-ow!" we turned and there, two chicks sporting leg ring bling, silhouetted in one of the tower windows like a pair of actors about to perform some Shakespearean play. Eventually we had to walk back to the Observatory. I slept the sleep of angels that night and dreamt of choughs taking a curtain call at the end of the play. Truly magical. Setting myself a challenge Day 15 – The Full Stop! As I begin to type this, I’m aware that this is my last self inflicted challenge to write 1000 words a day throughout my two week holiday. It’s Friday June 29th 2012, this is the last day of my holiday. I have made it, but only just. 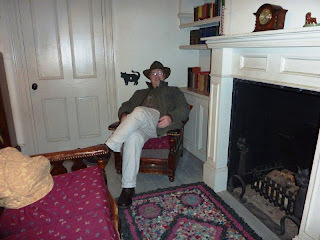 By the end of this posting I’ll have written about 16,000 words in a fortnight, which sounds impressive, maybe it is, but it hasn’t all been plain sailing. It’s been a bit of a slog at times. So why did I do this? Well, plainly and simply I like writing, but as my first posting said, I am not a good writer, nor am I a disciplined person. My personality is one of all consuming interest in a topic or process for about six months and then I become bored, I move onto something else for 6 months and the cycle repeats itself. By way of broadcasting what I was up to on Twitter and my blog, it forced me to be disciplined. I have no idea how many people read or wanted to read my ramblings, but the pure act of saying I’ll do it, forced the issue. However there have been times when the stress of having to write something got to me. But that is good, controlled stress is great for creating creativity. I’ve also confirmed through my challenge what I secretly already knew: if I get up early and write (or paint) I can be very creative. If however I leave the challenge to the afternoon or evening, creatively I really struggle. On average, morning compositions took under an hour to think, write and publish, with words and thoughts flowing easily and continuously. In fact most morning postings are written in a single burst of energy and left unrevised. By contrast those writings I left until the afternoon and evening took around 2 to 3 hours, they needed more correction, more revision and for me I felt they lacked that spontaneity of cognitive outpouring. I wonder if any reader can guess which were morning or which were evening creations? I have also discovered I am absolutely hopeless at grammar. Mind you there’s nothing new there. My school education was appalling, being educated in a liberal 1970s comprehensive school where errors were left uncorrected, homework nonexistent and educational standards at rock bottom. As a result, although reasonably intelligent, I am lazy and easily distracted. And this meant I failed my O levels in English Language and English Literature. To this day I struggle with what for me are the incomprehensible complexities of English grammar. What is a verb is? A noun? An adverb? All are like double Dutch to me. I’ve tried many times to understand English literature and language, but these subtle complexities of prose and composition are like a mist which falls across my eyes meaning that each time I write it is like re-inventing the wheel. I therefore have to offer my eternal thanks to Julie who each day, after reading Day 4’s appalling car crash of grammar and semi-colon ineptitude has painstakingly corrected my efforts. And that is something else which this challenge has been an eye opener for. The actual process of writing is a lonely task, but in reality I feel to write involves at least 2 people. Creatively my mind never switches off. Sometimes this drives me mad as I sometimes find myself batting about half a dozen ideas without any coherent reason. My father calls me a fidget. I’m never still, always on the go and always thinking up new creative things to do. In fact tomorrow we shall be off stone carving. No doubt that will become the next obsession and writing will be consigned to the “done that, got the t-shirt” part of my life. I like to write, but can I really call myself a writer if my composition is unread by others? To write is essentially an egotistical occupation. As a creative person I have an idea, I write about it, and therefore by default I then want others to read it. I may huff and blather with notions that as an artist my words are my own and it is irrelevant what happens to those words once written. Absolute poppycock. Creative people are egotistical. One should never generalise of course, but show me an artist who doesn’t want to see their paintings hanging on a benefactor’s wall, or a writer who doesn’t fill with pride when their words are published and I’ll show you some hens teeth. Maybe I’m being harsh here but anyone who is creative wishes to be acknowledged as such. Am I correct? And is this necessarily a bad thing? I’d say not. What do you think? By and large, before the advent of the Internet, to be published involved a middle man (or woman), be it editor for print media or a publisher for books. Self publication was always seen as “second best”, something a writer did because no one else wanted to take the risk with their work. These days, self publication is very much the norm via social media such as Blogs, Facebook and Twitter which are the supreme way to air unregulated thoughts; however by its very nature this unregulated aspect of social media is fraught with dangers. We can all recall someone sending out a message only for their words to be either misinterpreted or cannoned around cyberspace and the red-top newspapers with an almost evangelical zeal to bring the perpetrator to justice, with a sub-plot of “phew that wasn’t me this time”. In the past the publisher or editor would have prevented such errors before they hit the public domain. But the dangers inherent in self publication, can again bring a certain creative edginess to a work, I feel. But to prevent free speech, no matter how well meaning, is in my view one step closer towards the slippery slope of repression. I love the fact that the Americans invented the World Wide Web for secrecy and intelligence purposes, and in doing so they created a technology that is absolutely unregulated. And so my final unregulated free speech posting is coming to an end. I sit, I think, I write and I publish. If I get it wrong, I’ll be informed of this by another indulging in free speech. I hope though, by and large I get it right, and for those of you who have read one or all of these 15 essays, you gave your time freely, to allow me to indulge myself in my egotistical free-speech compositions. Today I bought yet another countryside book, this one a first edition of H.G Massingham’s English Downland. A book I had had on my radar for a while, but a book I didn’t expect to buy today. We were in Bristol to meet up with a lifelong friend of mine. We’ve known each other for 47 years and so we have a lot of history flowing under our friendship bridge. The reason he was in Bristol was to accompany his youngest son who, being set on becoming a doctor, was here to attend a Bristol University Open Day for prospective students. Sneaking off into the University staff refectory we had a very leisurely 2 hour lunch and catch up. After emerging from this oasis of calm, we encountered what resembled a surrealist painting depicting thousands of hopeful students and bewildered parents as they hustled and bustled about. At this point we said our goodbyes and leaving my friend and his son to the delights of Bristol University, we headed to the streets of Clifton and found ourselves in an oft-visited Oxfam bookshop. I’ve bought books here before. I’m not sure where they get them from but this second-hand bookshop has an ‘old’ section. As a result, I’ve spent many happy lunch hours in there, with scarcely a visit seeing me leave empty handed. Today I could have bought another copy of Highways and Byways of Dorset, but as this would have been my 3rd copy; restraint was needed. I did however leave the shop with a good copy of “English Downland”. Written in 1936, it is one of many such “guides” published before the war as people began to realise the centuries old landscape and traditions of England were fast being consumed by the modern age, especially with the arrival of the motor car. The majority of these books were written by established writers, who, we should remember today, were educated mainly in Victorian times and with their Victorian view of the rural idyll, wrote sometimes with rose-tinted nostalgia. Personally I like a bit of nostalgia. I feel we should respect the past and learn from it for the future. But between the Wars the British countryside was not a vision of rural perfection, far from it. What looked to the travelling artistic as rustic charm was often nothing more than shackled-to-the-land penury and economic deprivation. The Cotswold town of Broadway is a nice example of this. 30 years or so ago I got talking to an aged local, who was then in his 90’s. My description of this beautiful town and how it must have been wonderful to live here in the past was greeted by a smile. “It’s a much nicer place today, 50 years ago we had open sewers down the street and most houses were in a ruinous state”. That’s a novel way to describe unspoilt. That said, despite my reservations, I still like reading and having these books about the house. Often they are liberally sprinkled with old photographs or better still stylised pen and ink drawings of the subject. A book is much more than words and thoughts on a page, it is the smell of ages, it is the feel of the bindings, it is the language of the era that book was written, it is the whole, a living history of the writer’s thoughts, personality and intention. Recently I visited the Richard Jefferies Museum on the outskirts of Swindon. Writing in the late Victorian era, Jefferies, one of our pre-eminent writers, wrote wonderful descriptions of the Wiltshire countryside that are a joy to read still and his books are illustrated by exquisite linocut etchings which instantly say late Victorian England. But I do have a lot of books. Purchasing the odd book here and there is not too bad, but over the years the number of books in the house increases. Apart from the books in the office and the downstairs rooms, I have books in cardboard boxes and back in the North East my parents oversee my more valuable books kept firmly under lock and key behind the glass doors of bookshelves. Many book collectors are driven to obtain the full set of a series, or maybe every first edition by an author. Indeed I know of two top naturalists who have full sets of first editions of the New Naturalists Series. A fantastic effort given that many single volumes are now worth hundreds of pounds. But I’m not that sort of collector. Well I say I’m not; even I succumb to temptation at times. Last autumn I visited Stella & Rose’s bookshop in Tintern. Until then I had only bought mail order from this excellent antiquarian bookshop. But on this visit I was tempted by a mint condition, first edition of BB’s book “The Wind in the Wood” at an eye watering £190. At that price it won’t be well read by me. Most of my books are ones to read and enjoy, maybe not cover to cover in one go, but in a quiet moment I’ll look through the shelves and dip into whichever book takes my fancy and read a few chapters. Recently the advent of e-readers has revolutionised book publishing. They are a fantastic invention but I wonder what this means for the printed book? Do books have a future? The speed of technological advance tells us that in maybe 5 years time another technology will appear and obsolescence will consign the e-reader to the waste bin. Books however have been here for centuries. They can be handed down through generations, they are solid, permanent and what a second hand book can do is give the feeling that other eyes from the reader have seen that page, that word before. Often a book will contain a hand written inscription, in fact the one bought today just says June 13th 1938. Who wrote this date 74 years ago, and why just the date? It is intriguing. A quick search discovers this was a Monday. Did the first owner of this book pop out to the shops that Monday and buy this book for their enjoyment over the week ahead? I will never know, but forever that date exists on that page of my new second hand piece of history. Which is all a bit dry because defining something that is an ephemeral concept is by its own definition, difficult. I have long thought intellectually about the coincidences of meeting people, or more accurately seeing people, especially if this meeting is transitory and unfulfilled. I’m a keen people watcher, not in some sinister voyeuristic way, but as an observer of human activity. Train stations are a fabulous place to observe human activity of all kinds; they are a wonderful kaleidoscope of chaotic human coincidence. All these people rushing about have lives, lives which are linked to and separated from others by a degree of separation, a theory which states that everyone is on average approximately six steps away, by way of introduction, from any other person on Earth, which is an astonishing concept in itself. In a way I was part of this theory in 2006 when I travelled by train to Italy to visit friends. Entombed and hopelessly lost in the Paris Metro system I walked past a woman who was similarly lost and unable to make herself understood to an uncommunicative member of Parisian staff. She and I joined forces to extricate ourselves and find our own way to the Gare de Bercy station where the overnight trains to Italy depart. It turned out she was an opera singer from the Netherlands en-route to Venice for a job interview. Normally she flew, but that day there was a Europe-wide Air Traffic Controllers strike, so like me she travelled overland. As we waited for the train she suggested she purchase some food for us for the journey, which she did, returning just moments before our separate trains were due to depart. In haste we said our goodbyes, bordered our overnight trains and I never saw her again. But like many people I have fleetingly met over the years I often think about her and whether she got the job. I never did know her name but for a few minutes our lives collided and we shared an experience together. Films and books have long discussed such thoughts. Charles Dickens’s A Christmas Carol is of course a well known example of looking into the future. If Ebenezer Scrooge follows this or that path as outlined by his visiting ghost, his future will be redefined for good or bad. The romantic film Sliding Doors starring Gwyneth Paltrow and John Hannah is another well known exploration of this concept of “what if’s”. Missing her train on the London Underground, Gwyneth Paltrow’s character then embarks on a parallel universe plot, outlining what may have happened if she had caught her train, and what happened if she didn’t. And of course the poet Robert Frost’s poem The Road Less Travelled details the routes we take in life and their consequences. In reality every action we take has a parallel plot to enact should we choose it. How many times have we heard stories of people who missed their connections to a plane or ship only for some disaster to befall it and all hands are lost or killed? The survivors’ stories are often a powerful example of fate. Many say fate is something we have absolutely no control over, as it is something that supernatural forces direct. But is that true? As intellectual human beings, can we not bend fate to our own will? Intellectual minds far greater than mine will theorise over this forever. But what really interests me is what I prefer to call the ephemeral side of coincidence, where no actual contact is made but for a brief moment in time there is connectivity. This was something I noticed yesterday whilst driving. I noticed a group of four men on a Welsh golf course. They were on the green, one was putting, one held the flag, two others stood with their putters in hand watching. In our car, myself and Julie and for what can only have been a couple of seconds I watched the first man putting as I drove past. Those four men would probably have known each other. Friends maybe, or colleagues away from the office for a day. The round of golf would have been planned maybe a day or so before and in the morning they would all have left their individual houses to meet up for their leisurely game. That same morning Julie and I set off from Somerset on our visit to Wales. At around 12 noon our 2 sets of lives which had been separate until yesterday collided in time and space, for the briefest of moments, before separating again for eternity. Today we are all back in our own world, leading our own lives; but for me the memory will linger. Intent on their game, the golfers would be unaware I had seen them and carried on with their game as Julie and I carried on with our day. Writing about them now in a way could possibly break the unconnected side of this encounter. Maybe one of the golfers will read this blog in years to come and think “was that me he wrote about?” “I remember seeing a black Renault Clio as I held the flag”. I probably think about such things too much, but I do find them intellectually fascinating. Discussions at breakfast revolved around heading to a beach destination today. Sea air, negative ions, ice cream and a smattering of seagulls called us to the briny. Devon? Dorset? Cornwall maybe? So whilst Mrs Wessex Reiver consulted the map as to a premier coastal hot-spot, I headed into the kitchen to make a Man vs Food style sausage and egg breakfast combo sandwich. If you have not seen Man v Food it is currently on the Freeview channel Dave and hosted by Adam Richman. Each programme’s premise is easy and strangely compelling. Adam sets himself a challenge to find and consume the biggest - and I’m talking big here - food challenges available in America. Usually his prize if he succeeds is a t-shirt and a photograph on the wall of fame. His feat of eating 5 x 1.5lbs meat-and-French-fries-filled baguettes in under an hour has to be seen to be believed. My breakfast bap combo wasn’t quite as large, but stomach filling it most definitely was. I lay on the floor for 10 minutes to recover from this overindulgence, as a voice was heard stage left. “Let’s go to the Gower”. Good choice. I’ve never ever been to the Gower in South Wales. Ever since moving to Bristol in 1993, colleagues and friends have said to me “you must go to the Gower, it is fabulous”. So for nearly 19 years I’ve wanted to go. Advertising images of Rhossili Bay gleaming in bright sunshine do look absolutely stunning. Legion reasons have prevented me going but today, after checking the weather forecast, we headed off up the M5 to the Severn Bridge, paid our £6 and headed deep into the land of Owain Glyndŵr; although in our haste we had forgotten a map. By Cardiff mist had begun to skirt the Valleys and by Swansea what can only be described as a pea souper had blanketed the entire Celtic landscape. Port Talbot is best seen in thick fog and whilst in reverie for this small mercy, I nearly missed the brown tourist sign “To the Gower”. A sharp left saw us descend into the underbelly of Swansea. On a grey, fog-enveloped June day Swansea is not at its best. The Amazon.co.uk huge warehouse is impressive, but not quite on the tourist trail yet, although the Celtic Lawnmower superstore looks fun. Wave upon wave of traffic lights loomed out of the deep gloom; each seemingly set to turn red as we approached. A sign gleamed, “Gower” to the right, so in a balletic manoevere across three lanes we found ourselves in a Short Stay Hospital car park. Did I mention we’d forgotten a map? Retracing our steps we then took in the delightful aspects of street upon street of grey pebble dashed houses adjacent to grey streets enveloped by grey fog. It reminded me of bleakest parts of Tyneside, and unfavorably so. Like an Olympic torch bearer we sped into, through and out of the Mumbles in the blink of an eye. Let me summarise that from there by hook and by crook, or at least every single track lane in the Gower we finally made it to Rhossili after the most pleasurable and leisurely hour and 20 minutes drive from the M4 possible. Tempers were fraying. At Rhossili the fog was so thick I had difficulty seeing the car park attendant grunting something in his Liverpudlian accent about £3 to park. In front of us was a cratered field awash with water, mud and ‘yooths’ in surfing gear. Californian surf dudes look bronzed, muscular and fit; Rossili’s Celtic cousins looked gangly, pasty white and about to expire due to hypothermia. Looking first at the attendant, then the fog, we did a U turn and, although initially thinking we’d drive somewhere else instead, we parked further up the village in the Church carpark. I’d rather give the Church my money as a donation to park, and so I did in their honesty box. Improvement of our now frazzled demeanor however did come in the excellent guise of The Bay Bistro and Café. Optimistically, the sign outside advertised glorious views of Rhossili Bay while sipping a Barista served coffee. Predictably no one was sitting outside as the scenic view of the fog- enveloped landscape wasn’t really a major draw. Inside though was busy, packed with damp walkers and hypothermic surfers; it was also humid. Lingering for just a moment at the door, our brief indecision whether to go in or beat a hasty retreat was dispelled by the menu board proclaiming a veritable smorgasbord of vegetarian options, of which we partook of heartily. The food was excellent and with coffee consumed, a voice was heard stage left. So thick was the fog I hadn’t realised a beach existed, but scrambling down the 200 foot cliff footpath, there at “The End”, as some wag had scrawled into the erstwhile wet cement, was Rhossili beach. Empty of human life, in this thick fog it was moody and fantastic. We walked along the tide line with the sound of the sea as our constant companion. I gathered shells and took a photograph or two. Adding to the mood of the day it began to rain, but onwards we went. The return walk was just as damp and so as I emerged huffing and puffing at the top of the cliff path, we once again entered the comforting interior of The Bay Bistro for refreshment. Coffee consumed, a voice was heard stage left. In 2010 Rhossili Bay was voted the best picnic spot and the best beach in the UK. It was a superb beach I have to admit and we did have a fabulous walk in the gloom. It would be good to see it again in the sun. But I know of better beaches in Britain which are just as impressive and just as empty. More importantly to get to them does not involve traversing miles of urbanised sprawl. As if to add insult to injury, we tried a few sandy bays on the way home, each seemingly turned into a caravan park with a grumpy car park attendant with a Liverpudlian accent demanding money. I like Wales, I like the Welsh people, but I’m sorry, even in glorious sunshine, I think it will be a long time before I’m persuaded to visit the Gower again. Shocking I know but I’m back on a wildlife theme with this 1000 words posting. For those of you following my 2 week challenge you will know I’m trying not to write about wildlife. I do that anyway so that would be cheating! Yesterday, as my posting hinted at, I was in Full Monty (not literally you understand) DIY-Sunday mode. From waking I was on a quest to paint our bedroom wall. Starting at 9.30am I finally got everything back to being ship shape and Bristol fashion by 10pm. It was just emulsion but preparing, cleaning and finishing off takes a lot longer than the painting itself. And I’m a fussy painter too; I could paint in my best suit and still not have any paint on me… hum maybe a second career here. But by 10 o’clock in the evening with the bedroom back in position, curtains returned to the perpendicular, radiator reassembled, brushed cleaned and stacked away, most people would have collapsed into the bed and the day would be over. But I’m made of sterner stuff (some could question this statement and say I’m just mad). However as I looked out of the window of what had been my cell for nearly half a day, it was a fabulous evening, a glorious sunset had just ended and a calm clear night was developing; and I hadn’t left the house at all in 2 days. Being such a lovely evening I said to Julie how about we go and have a quick drive to Little Bedwyn about 7 miles away, and see if we can spot a glow worm or two. In reality my thought was more, “I’ve got cabin fever, and please can we go and see something outside before retiring for the day”. I didn’t really expect to see any glowing beetles. Arriving at Little Bedwyn, we parked down a lane and headed for the canal and railway. In society there is something strange about being outdoors at night. In daylight if I was seen wandering about with a pair of binoculars and a round of egg and tomato sandwiches, no one would think anything other than Wessex Reiver on walkabout; mothers would whisper to their children, “just walk quickly past, don’t speak to him he’s harmless really”. Fast forward 12 hours and wander about in the dark with a torch and battery down footpaths and village lanes, curtains twitch, security lights come on and is that the bark of an attack dog about to be unleashed, why I always carry a cudgel and wear a balaclava to blend in unobserved should the dog be on guard; this gets worse doesn’t it….. Some of you may remember Ann Widdecombe’s cutting remark about the MP Michael Howard that "there is something of the night about him". Unlike Lord Howard, I may not have demonized tendencies but I do like the dark. As humans we are sight dominated animals, which is why our eyes provide binocular vision, point forward, and are able to adapt to differential light levels. Being abroad at night is exhilarating, sounds are heightened; we have to rely on hearing and some primeval subconscious senses more than we do in daylight. And being unable to see we are aware of anything out of the ordinary. And so it was yesterday evening as I stood on the railway footbridge. There next to the railway line was something out of the ordinary: a piercing bright green light, no bigger than a match-head in size. This was the very bright illumination from a female glow worm; then another and a third. All in all, in half an hour we saw 11 glow worms next to railway lines, all seen from the vantage point of a bridge, their glow clearly visible with the naked eye. But night time is something which is becoming less and less prevalent in the World, with the arrival of ever more artificial means of keeping the dark at bay. A fascinating read if you are interested in such things is “Evening’s Empire – A History of the Night in Early Modern Europe” by Craig Koslofsky. I read this book last year when it was first published and it is a wonderful and eclectic summary of how Civilisation has worked relentlessly to banish the night, for example how street lights changed cities for ever, making streets safe to walk in and opening up the possibility of pleasure in the dark through lit theatres. Chapters also cover the devil, mythology, theatre and the gradual removal of the power night had over human activity as the use of increasing light was developed. One aspect of the night I absolutely love is candlelight, and for me when we lose an hour in October and it is dark before 6pm, it is a perfect opportunity to close the curtains, and sit quietly with no other illumination that a lighted candle or two. A couple of years back when I was painting much more than I am able to do now, I drew a composition in charcoal while a single candle burned. 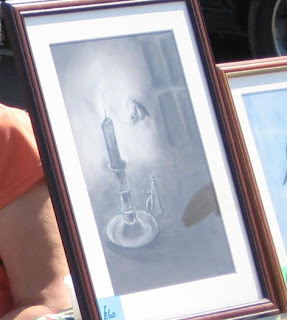 The resulting painting was called “Last Flight” as it depicted a moth coming to candlelight with a terminal outcome, and a painting I sold the week I sketched it. I wasn’t even selling at the time as I’d just arrived at the Black Swan Art Car Boot Show in Frome and busy sorting myself out and erecting my stall. Putting painting on an easel and out of harm’s way, this gentleman walked past, stopped, walked back and came up to me. “I know you’re not open yet, but please don’t sell that, I haven’t got money but will go to the cashpoint”. He left and returned with a fist full of £10 notes” My first sale of the day and before the event had begun. This is the only painting I’ve sold which I regretted selling, because it reminds me of a night spent drawing in almost total darkness. I didn’t have time to properly photograph it except at the show, so I often wonder where it is now, and whether it still gives the owner pleasure. From starting this 1000 word challenge to completing it, 4 hours have elapsed and 78 miles. I’m completing this in Somerset but it began in Wiltshire, such is the life of a 2-house lifestyle, and weakly explains the delayed posting.